From Goodreads: As romantic as Shiver...as intense as "Before I Fall". 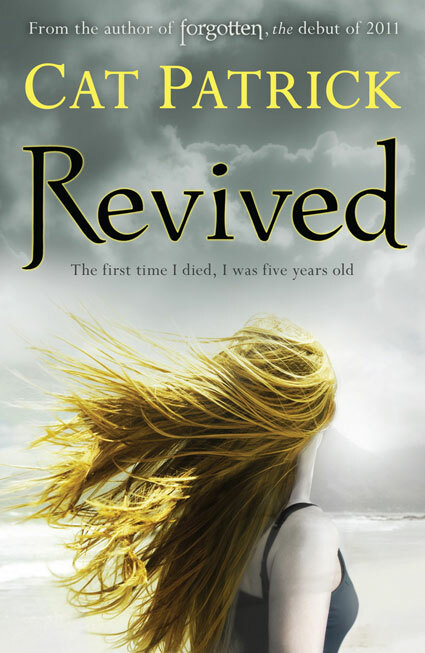 Revived is unmissable. The world fades to nothing, and before I have the chance to think another thought...I'm dead. My name is Daisy West and my whole life is a lie. I'm part of a programme to test a drug called Revive - a drug that brings people back from the dead. I have died five times. I've been Revived five times. With each revival comes a new name, a new town...a new life. But this time, I won't let myself die. This time, I've found a love that I can't let go of. This time, I'm going to make my life my own. I really fell in love with Forgotten when I read it last year, so I was looking forward to reading Cat Patrick’s next novel. There is just something very addictive about her books! What I love most about Cat Patrick’s writing is her characters and the relationships they form. While I did really enjoy the concept of this book (government conspiracy, secrets and so on) I connected more to Daisy’s need for a proper friendship. I loved the relationship she had with Audrey and Matt. He is rather swoon-worthy and the friendship that develops between them all comes across as genuine and real. I loved everything about that storyline and how it connects perfectly with Daisy and her issues with Revive. How it makes her question everything she thinks she knows. I also really enjoyed the relationship she has with Mason– it feels from the start as if they really care about each other. More father and daughter than someone posing as her parent. And I loved her friend Megan - it's nice to see she has managed to stay connected to someone. Overall this was really exciting - full of drama, tension and relationships that will stay with me long after I finished reading – I am seriously looking forward to seeing what she writes next! I love the premise of Revived! If it's anything like Forgotton, it'll be fab - can't wait to read it!